Hundreds of thousands gathered in Washington, D.C. on Jan. 21, 2017 for the Women's March. Organizers are rallying in Las Vegas this year. 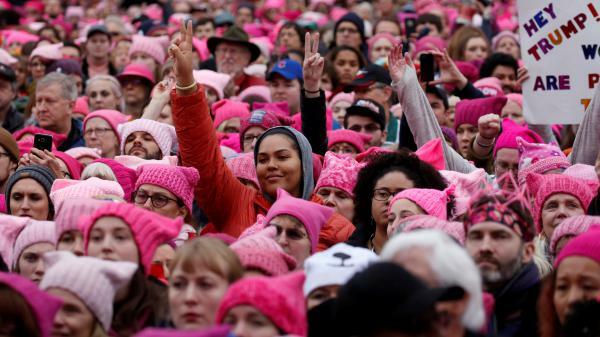 On Sunday, people around the country will mark one year since the Women's March on Washington, D.C. Last year it brought hundreds of thousands of liberals to the capital, many wearing pink knitted caps in solidarity. Others marched in hundreds of cities and towns across the United States and more than 80 other countries. Last year's march was definitively in protest of President Trump, coming just a day after his inauguration. A year on, the organizers of that national march are marking the anniversary with a rally in Las Vegas on Sunday as more than 300 towns and cities organize their own anniversary marches and rallies through the weekend. With midterm elections approaching, the theme this year is less outrage and more organizing, dubbed "Power to the Polls." National and local organizers say they chose Las Vegas because it is an example of successful grass-roots progressive organizing. In 2016, Nevadans elected the country's first Latina senator, Democrat Catherine Cortez Masto. "It was more important for us to create an event somewhere strategic to reflect the work that needed to be done in 2018. And Nevada is an example of a battleground state that went for Hillary Clinton and went blue in 2016," says Bob Bland, co-founder of the original march. "There are a record number of women running for local office and then also for state and governorship and there are competitive Senate races. We want to uplift that local work on a national scale on Jan 21." Nevada, she says, is just the beginning. The Women's March organizers will be holding rallies in 10 other swing states. The anniversary marches and rallies come in the midst of a movement against sexual violence. Women who wrote to NPR from across the country say they are marching this weekend to express concerns about immigration policies, environmental policies, women's rights, the gender pay gap, health care and more. But mostly they're doing it to show they are a powerful voice that wants to get more women like them into positions of power at the local, state and national level, they say. That, Bland says, is the point: getting people to vote and removing barriers to voting for marginalized communities. "If people mobilized a bus to the Women's March, they can also organize transportation routes to make sure people from low-income housing in their community can get to the polls," she says. "There's a lot of different ways that all of the organizing work, all the education we've done during the 2017 resistance, can be converted to our collective power at the polls." Emily's List, an organization that coaches Democratic women on running for office, says it has trained more than 26,000 women to run for local, state and national office. Its motto: "You marched. Now run." The march last year was criticized for being a crowd of mostly white, liberal women. Organizers say the aim this year is to harness the grass-roots work they did over the past year to represent a cross section of America, including people of color, LGBTQ people, the disenfranchised and women across the country. "Diversity does not come without intention and it doesn't come without authentic relationship-building. And that is something that takes time," Bland says. "We are making those changes and we are making a lot of progress. But this is work that we have to commit to every day. And white women in particular have to take responsibility for holding each other accountable to creating open, welcome spaces where communities of color know they are listened to." The roster of speakers in Las Vegas is a who's who of liberal politicians, celebrities and civil rights activists. They include Planned Parenthood President Cecile Richards, co-founder of Black Lives Matter Alicia Garza, actress Marisa Tomei, several female congresswomen including Masto, and the four co-chairs of the Women's March. While organizers say conservative women are welcome, many conservatives say they don't feel welcome at the marches and rallies because of their political leanings or support for the president. After all, organizers openly call themselves "the resistance." "For my mother, my ancestors, for those who cannot, for myself, for my nieces. To show the rest of the red state of Tennessee that women's rights are not just BLUE, they are all encompassing. You don't have to be a Democrat to support women. And just because you support Republican values doesn't mean you're against women. It's a human thing. This idea needs to change." — Melissa Shah of Nashville, Tenn. She plans to march in Nashville. "Protections for the environment have been undermined, racist and xenophobic policies have been proposed. This is an election year, and we have the chance to truly let our voices be heard." — Julie Albert of Anchorage, Alaska. She plans to march there. "After coming out of my shell as a brown female I've realized that women love to be feminists when it is only convenient for them — this meaning until it has to do with people of color, LGBTQ and any other forms of internationalism that there is a lack of inclusion from white women. Women of color and those who identify are still having to push themselves into spaces where they belong in the first place because feminism is about equality for all but that message seems to be lost." — Sanjana Stein of Denver, Colo. She marched last year in Washington, D.C., but this year has chosen not to participate. "Now more than ever we need to speak up, show up and be active citizens. My adopted 16-year-old daughter is a biracial Latina, and I am attending the Women's March again, alongside her, in order to show her that our voices matter, and that the power of a strong, intelligent and diverse population is what makes America worth protecting." — Andrea Morgan of Ovando, Mont. She will march in Missoula, Mont. "Last year's march was incredibly impactful and resonated with women internationally. After the march I felt empowered, and I was driven to be more politically and civically active. This year, I have been selected to speak on the #MeToo movement in our local march and I could not be more proud to call my fellow townspeople to action on issues that are important to me and many others. This march is focusing in large part on civic engagement and I hope to be inspired to do more and inspire others to engage in local and state elections, not just national elections." — Elisabeth Malloy of Statesboro, Ga. She will march in her hometown as she did last year. "I am transgender and I'm furious. I'm tired of blatant disrespect ... I feel if I did not attend the Women's March when I am fully able to and free then I would be failing my duty to my community, fellow minority communities, and myself. I will not surrender to discrimination." — Coryn Rinta of Boston. She will march in Providence, R.I.
One year ago, tens of thousands of women in Washington, D.C., put on these pink knitted hats of solidarity, and they marched down Pennsylvania Avenue. Similar marches happened around the world in dozens of other countries. It was dubbed the Women's March, and it was about a lot of things. It was a rally against sexual violence. It was for reproductive rights and against gender discrimination of all kinds. But it was also decidedly a rally against the new president, Donald Trump. Now, a year later, the march is happening again. The marquee event this time, though, is in Las Vegas. It will happen this Sunday. NPR national correspondent Leila Fadel will be there, and she joins us now. Hey, Leila. MARTIN: Presumably, this is still a political march against the Trump administration. So why is this happening in Las Vegas and not D.C.? FADEL: Well, I think they wanted to leave the D.C. area and go out into the country. And local and national organizers that I spoke to called Nevada really a bright spot when it comes to national organizing. They said this is a purple state. They said in 2016 it went blue. It went to Hillary Clinton. The first Latina senator was elected here - Catherine Cortez Masto. Also there's a Republican governor, Republican incumbents. They want to highlight that type of work. They call it a bright spot - that type of political organizing. And they're also calling it a launch - that this will be the first on a tour around the country. Take a listen to Kelley Robinson of Planned Parenthood, a partner in the organizing of these marches. KELLEY ROBINSON: The same people that were rallying in airports across the country and marching in streets, they're now sitting in state legislatures all across the country making decisions on policy. FADEL: She's referring to people like Ashley Bennett in New Jersey, who was a first-time candidate last year and ran against an opponent who mocked the Women's March, and Danica Roem in Virginia, who became the first openly transgender person to be elected to the Virginia General Assembly. MARTIN: So they're saying that this march sparked a movement, which then has put women into positions of power - into governing positions. I want to ask, though, about diversity of the movement because the march last year got a lot of flak for being pretty homogenous - being predominantly a group of white, liberal women. Has the movement diversified? FADEL: Well, definitely when you look at the organizing that's going on in Nevada - for example, I was at a sign-making event for Indigenous women who will be participating on Sunday. And there is an attempt to reach out to different faiths, to different races, to different classes, to different ages. But there isn't an attempt to reach across the aisle to the right side. The national organizers, a diverse group of women, say that they're resistance to the president. And so women who are on the right side of the political spectrum, who support this president, who maybe rally on issues of anti-abortion, they don't necessarily feel welcome at these marches. MARTIN: You have been talking with some of the marchers who plan to attend the event - the march on Sunday in Vegas. What have you heard from them? FADEL: Well, I asked listeners to send me notes about why they're marching. And we got hundreds of responses from women across the country - from Tulsa, Okla., to Kent, Ohio, to Anchorage, Alaska. And they say they're marching to be a visible force on everything from women's rights to the gender gap to the #MeToo movement to immigrant rights and rights of people of color. But the most common response was about making themselves into a powerful voice that elected officials will have to listen to. And I'll read you one response from Julie Albert of Anchorage, Alaska. She says, quote, "protections for the environment have been undermined. Racist and xenophobic policies have been proposed. This is an election year, and we have the chance to truly let our voices be heard." MARTIN: NPR's Leila Fadel, she will be covering the Women's March - the marquee event happening in Las Vegas this Sunday. Leila, thanks.